Free WordPress CMS themes are a great way to get started with WordPress websites. If you are new to WordPress these themes are ideal to get started with. Or if you are confused before buying a premium theme, you can opt for the free version and try the theme with basic features before buying the premium version with additional features. If you are a WordPress newbie and want to try creating a website by your own, you can use these themes. They are free to use, so no investment to learn. You can try using the features and setting up a website with these beautiful themes before actually going for premium themes. Some of them are the basic theme versions with a paid upgrades. The basic versions can be used for trail purpose. If you like the theme then you can go for the pro version with additional features. Most of the themes in the list allow you to tweak the code. So, if you are a programmer, it’s like getting a free design. The features can be added by changing the code of the theme. You can even check out our free WordPress themes collection. This is the list of the very best WordPress themes that are free to download and can be used to create any kind of online news or online magazine. So if you want to create a fashion magazine, an entertainment news website, a tech news website, or a general news channel, you can pick up one of these themes. All these free themes are easily customizable and free for personal or commercial use. They all are periodically updated to make sure that they run well with the latest version of WordPress. This is the free WordPress theme to create your online news or a magazine website of almost any subject. It offers you to choose from 4 different blog styles to choose from. There are widgets, abundant customization options, menu and sidebar options, icon and slider options, and many other great options. Being SEO friendly makes this theme ideal for your blogs and magazine sites. Takeaway: The theme is developed using Twitter bootstrap 3 and allows integration of the best WordPress plugins for contact form, and supports microformats and Font Awesome icons to make your website more reader friendly. For a free theme, Greatmag has really great features and design. This theme can be used for creating a perfect news magazine or a blog website with WordPress. GreatMag comes with inbundled widgets and allows you to choose from 4 different blog layout designs. It supports Google Fonts. Moreover, you can even integrate page builder to start designing pages on your own. Takeaway: Want to create a magazine website in local language, GreatMag has it all you need. The free package includes the files needed for complete and perfect translation of your website. Purity Lite is a modern news magazine WordPress theme that can be used for personal or professional purposes without any restrictions. You can also use this theme for your blogs. It is easy to use and comes with intuitive theme options to customize your site and make it look and work just the way you want. Takeaway: This is one of the best rated free magazine and blog theme. Moreover, it is RTL ready to create a website in Arabic, Hebrew or any other RTL language. Also, this theme has a upgrade version. So start with the free theme and you can upgrade any time you want. This news magazine WordPress theme can be used for online magazines or news site of different niches. For example, you can create a fashion blog, a religious news website, a showbiz new website, etc. This free theme has a modern and beautiful design. It is flexible and easily customizable. It is a social media ready website that makes promoting your articles really easy. 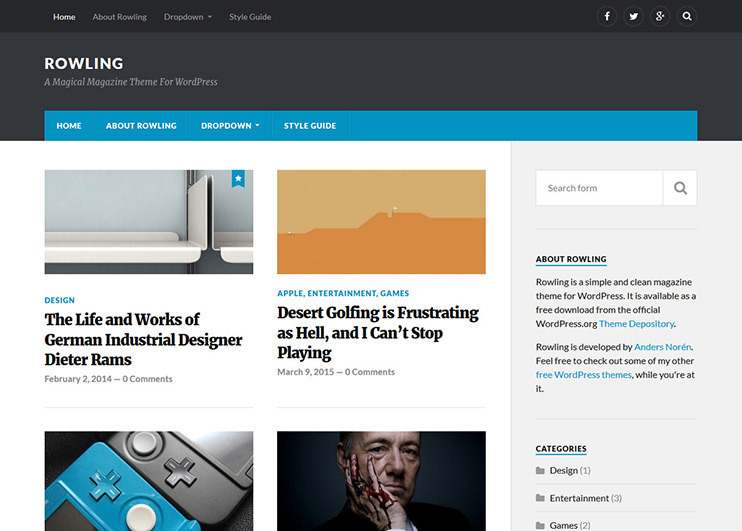 Takeaway: This free news magazine WordPress theme from colorlib has one of the best designs. It gives your website a professional look and feel, simple yet very attractive. 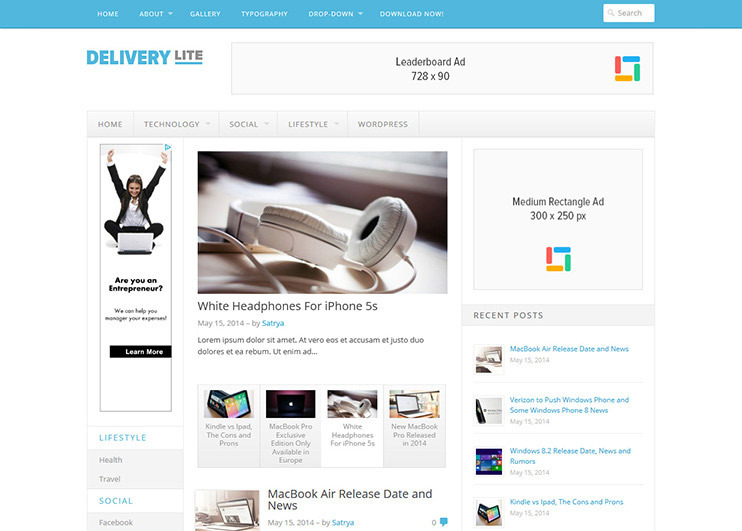 Delivery lite is a WordPress theme that is designed to deliver your content elegantly. The theme has a beautiful content slider where you can show the featured posts. It comes with custom widgets. It is designed to handle a large amount of content. So, you can use this theme to create a busy news or blog website. It is easy to use and customize. Takeaway: You can create a beautiful featured content slider with the posts you want to highlight. This is a beautiful feature for magazines to showcase the latest news and articles. This news magazine theme has great way to organize content using different layout options. MH magazine is a free WordPress theme for magazines. 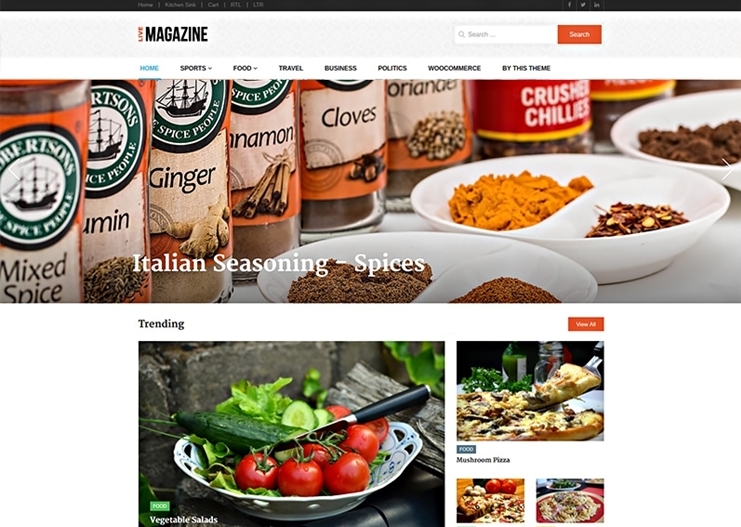 With this theme, you can create a simple online magazine in minutes. MH magazine is completely widgetized. So you can organize your content by placing the widgets at proper widget areas. The theme comes with basic theme management options. If you like the basic version of the theme, you can buy the MH magazine premium version with advanced features. Takeaway: If you want to have space for expansion in future, there’s a premium version of MH Magazine to upgrade. However, even the free MH Magazine theme has all the features you would want for a basic news or magazine website. Rowling is a free magazine theme. As the thing that matters most for a magazine is the typography, Rowling pays special attention to its details. This theme is designed to let you create a perfect magazine. There is the feature to let you show related posts in your magazine. This theme is highly customizable. 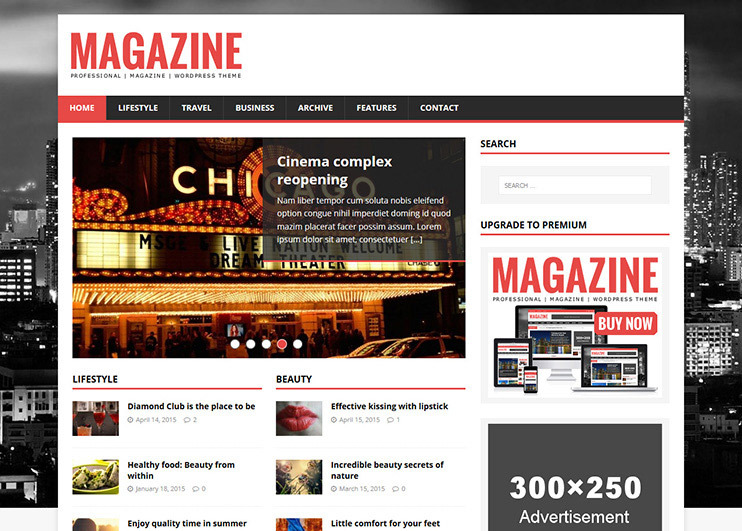 It is a simple and efficient theme to let you create a magazine very efficiently. Takeaway: Rowling Magazine theme has a great typography and a super clean design. The central focus of your website will be your articles and nothing else. 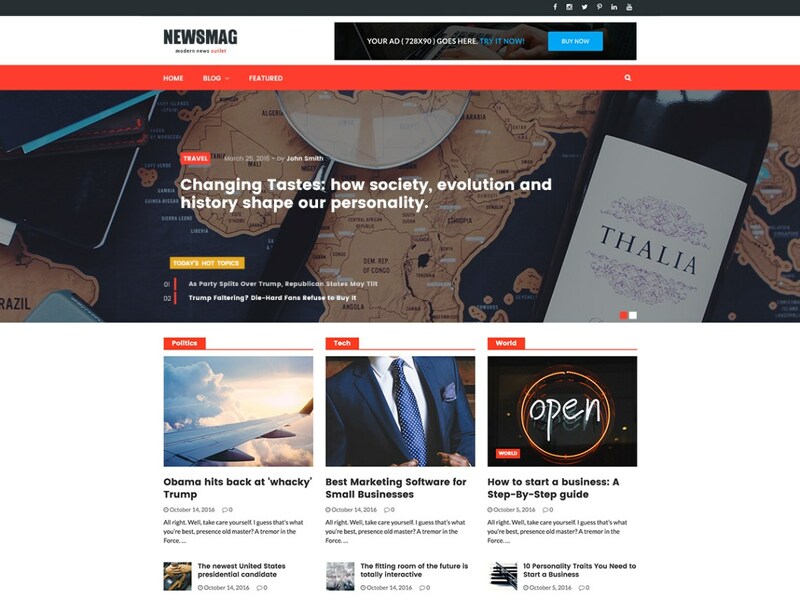 This Free news magazine WordPress theme has it all you need for professional looking blogs, news and magazine websites. 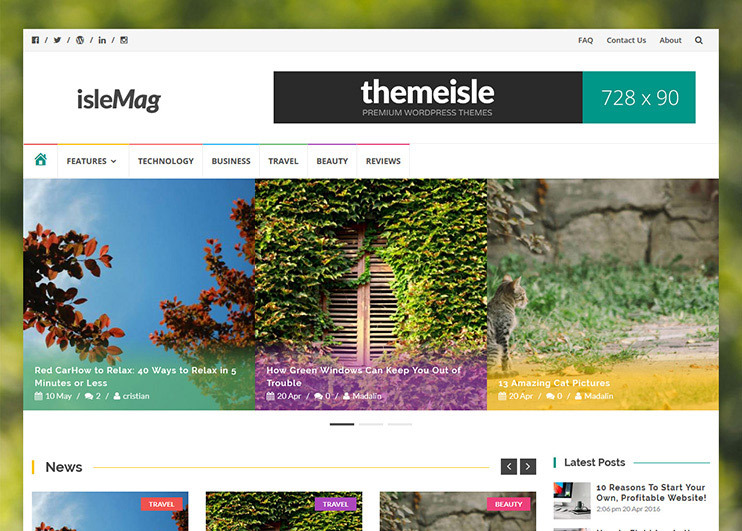 Isle Mag is a free magazine WordPress theme. If you are new to WordPress and interested in trying out a magazine website, download and give this theme a try. If you know to code well, you can tweak the clean code and add features to your website. It is easy to manage. There is a carousel slider that you can use to display latest posts and news. Takeaway: If you want to start monetizing your website right away, you have this Free Magazine theme with Google AdSense ready design. The pre-designed banner areas are an effortless way to start using your website traffic to earn through advertisements. Hueman is a beautiful and SEO friendly WordPress theme for creating blog sites. This theme is completely mobile friendly and one of the best rated free themes for magazine sites. 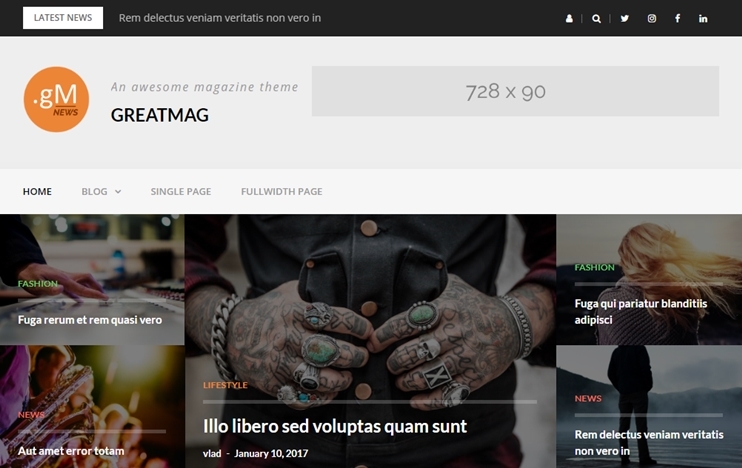 This theme currently has more than 70,000 active installs and great for creating stylish news magazine websites. 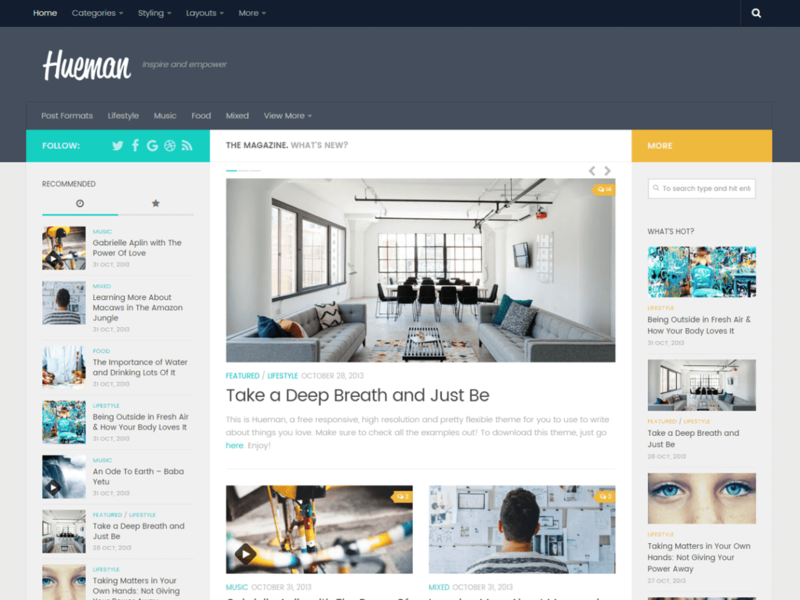 It is one of the best free WordPress personal blog themes. Takeaway: For a free theme, human has too many features and too many customization options. Social media integration, styling options, indepth documentation, and even a page builder to get you started easily. This is a professionally designed free WordPress template for news and magazine websites. It comes with ample customization options to let you personalize your site as per your requirements. This magazine theme is SEO friendly and great for creating blogs as well as online magazines. Takeaway: Live Magazine has a cheerful and multipurpose design. This makes this free News theme perfect for almost any niche. Additionally, the customization options are intuitive to make website building a breeze. Here are some of the Free eCommerce WordPress themes that you can use to create your online store. While there are several eCommerce website building platforms available, they are expensive. WordPress and WordPress themes make it possible to set your eCommerce stores online without extra efforts and expenditure. Most of the eCommerce themes listed here are based on WooCommerce. It is one of the best eCommerce plugin, free and reliable. These eCommerce WordPress themes are free, easy to use and highly customizable to create online stores that perform well! 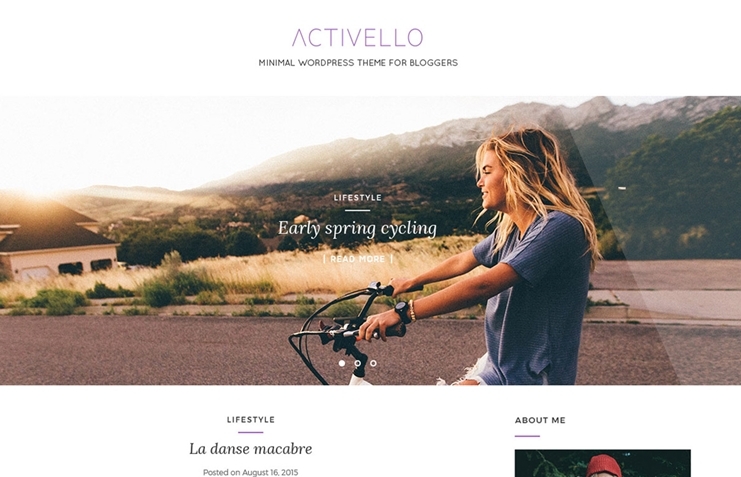 Activello is a multipurpose WordPress theme that allows WooCommerce integration to create a fully functional online shop. It has a clean and modern design and is definitely one of the best free responsive WordPress themes available. This theme is best for you if you want to run a blog and complementary eCommerce websites based on WordPress. Takeaway: Activello supports infinite scrolling. This will be best for your eCommerce website to load products faster, without requiring users to click on the next button. 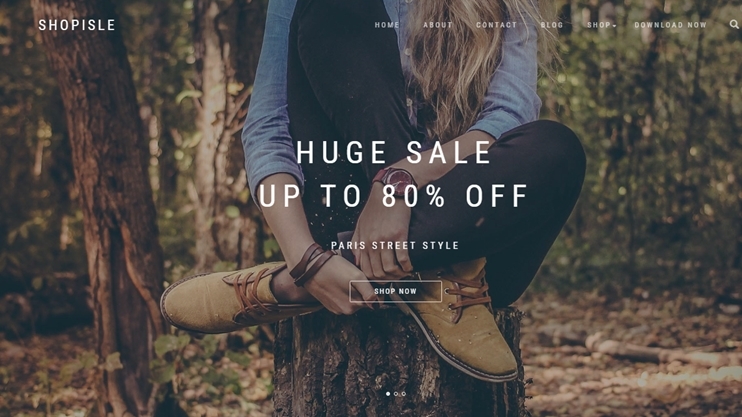 Shopisle is a free eCommerce theme with a stunning design. It comes with a option rich and well organized theme options panel to adjust your shop. The theme has a clean code and beautifully responsive design. Takeaway: Shop Isle has very attractive design. This free eCommerce theme has a professional looking layout with well-designed and clean product pages that highlights your products beautifully. 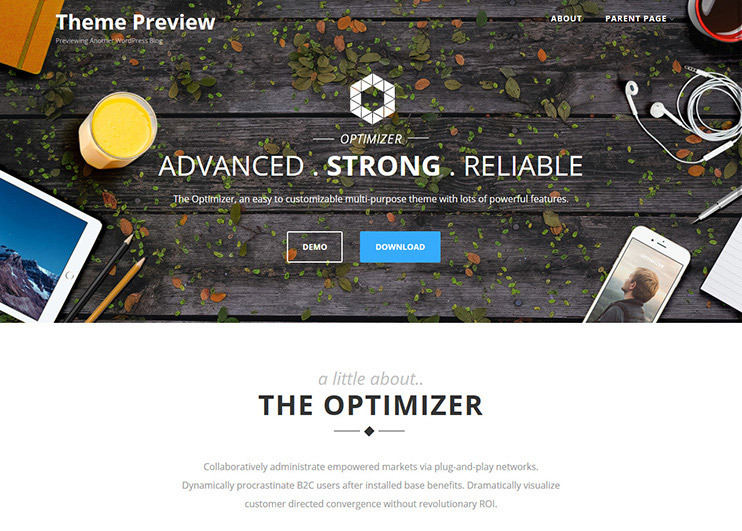 The Optimizer is an easy to use theme that is feature-rich and easy to use. It allows you to perform lots of customization options. It is optimized for speed and performance. The theme lets you create a very personalized website effortlessly. It allows WooCommerce integration for the eCommerce features in your website. With this theme, you can create a clean and minimal website for your corporate business, landing page, portfolio as well as personal or eCommerce website. Takeaway: The highlight of this theme is its flexibility and the customization possibilities. Optimizer also has pro version if you wish for an upgrade. 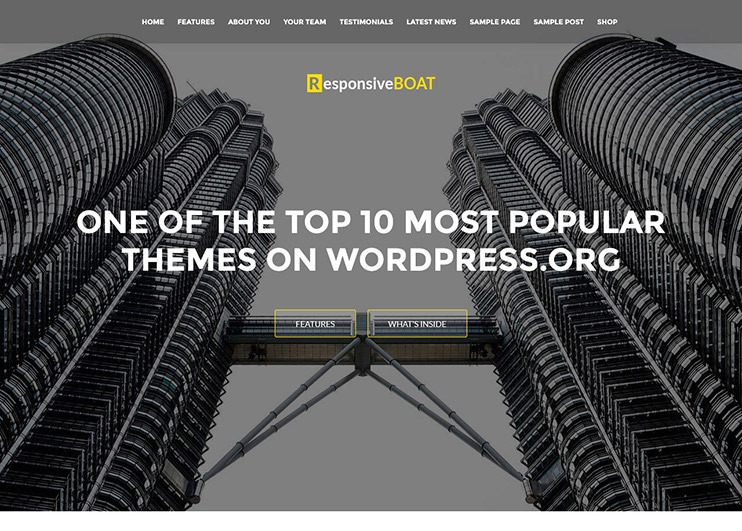 Responsive boat is one of the best free WordPress themes for business. It can be used to create a simple business website that showcases your business details. The theme allows you to include eCommerce features into your website using the WooCommerce plugin. It works as a one page business theme so that you can present all the business detail at one page. So, if you want to create an elegant WordPress theme with one-page parallax effects, you should consider a Responsive boat. Takeaway: Create attractive one page eCommerce websites with the Responsive boat. It is ideal for franchise store with limited products. 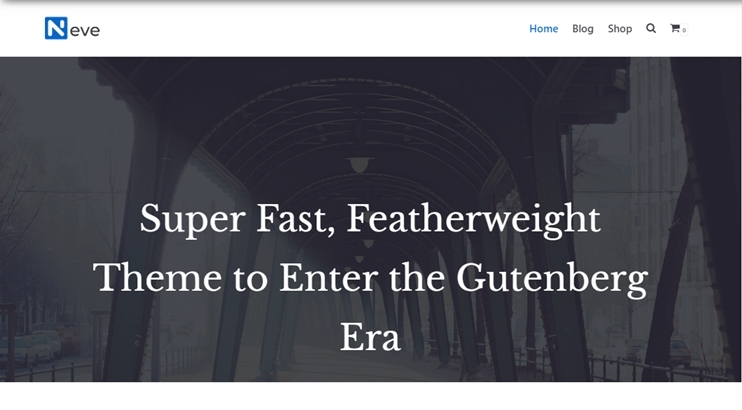 You can create beautiful page with parallax and smooth gliding sections. Flat on is a simple theme that has a modern flat design. It is a responsive and multi-purpose theme. This theme is one of the best free WordPress personal blog themes and can be even used for corporate or business website. Flat On supports Jigoshop eCommerce platform. You can choose from the 2 color schemes. It is easy to use and flexible. With flat on you can create an interesting and beautiful WordPress website for your company. Even if you are an enthusiastic writer, flaton lets you create amazing blogs. Takeaway: Don’t want WooCommerce? This theme is powered by JigoShop. It has a beautiful flat design. 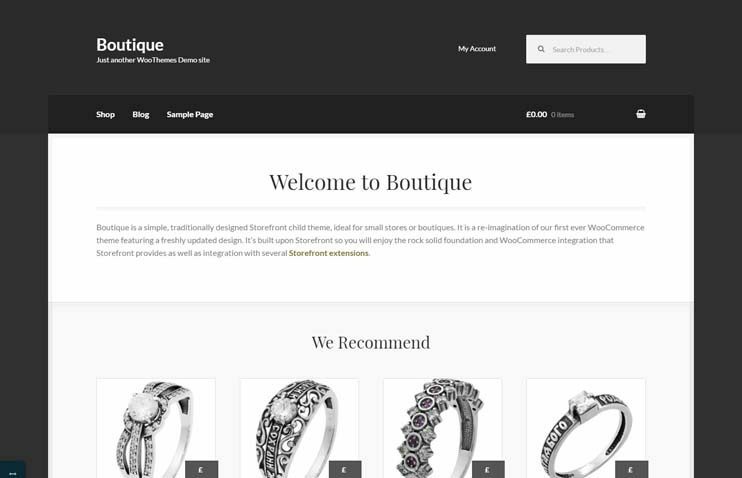 Boutique is an elegant and powerful eCommerce theme based on WooCommerce. The theme is designed and optimized for best Online shopping experience. The Boutique theme is a child theme of the free WooCommerce theme called the storefront. It is SEO friendly and highly customizable. Takeaway: Boutique is a free responsive eCommerce theme designed for the purpose. The theme is ideal for a fashion boutique. However, it is multipurpose and can be used for any purpose. 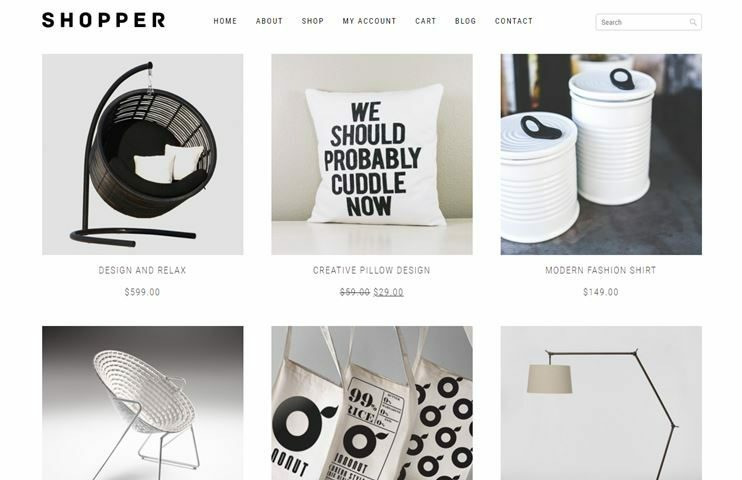 Shopper is a free WooCommerce theme with unique design and clean look. This responsive theme compatible with the popular WooCommerce plugin is perfect to get started with your ecommerce shop. It is free, elegant and SEO friendly. Shopper WooCommerce theme is flexible and easy to use. Download this theme for free and create a simple and beautiful online shopping website to sell your products online. Takeaway: Shopper can also be used as a corporate business website template, without all the eCommerce features. As well as, you can create a fully functional eCommerce website too. 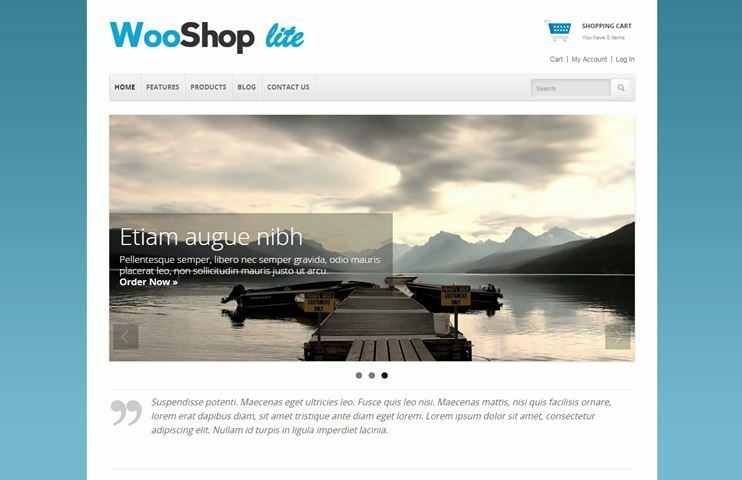 WooShop lite is a free general purpose ecommerce theme that supports WooCommerce. You can use this theme to create a website of any subject. The theme is flexible and easy to use. It is the lite version and if you want to include advanced features in your website, you can use the pro version of the theme. Apart from WooCommerce support, the theme comes with a well designed blog page. So, you can publish your news and notices. Takeaway: WooShop is one of the best eCommerce WordPress themes. If you want to try it’s free version, download and use the WooShop lite and experience the backend & flexibility. Shopera is a theme that is specifically designed for creating online stores. The theme comes with easy customization options and lets you create an online shop. You can use this theme to create an online shop of any topic. It has a clean and modern design. It allows seamless integration of WooCommerce for ecommerce facilities. Takeaway: Shopera is a basic WooCommerce theme ideal for small eCommerce websites. It is a blog style theme that allows you to sell with style. Alpha store is a free WooCommerce WordPress theme. 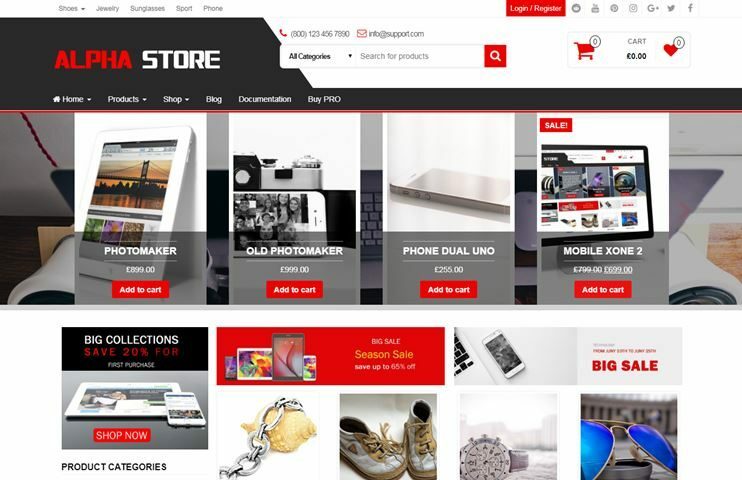 You can use this theme to create an online shop of almost any subject. The theme can be used to create a full-focused ecommerce website. It has all the features to create and manage an ecommerce website. It is free, beautifully designed as well as feature rich. This theme also supports WooCommerce addons like wishlist, quick view and product compare. Takeaway: It supports wishlist and comparison features for your website. These features are the some of the most desirable features for an eCommerce website. These are the best Free WordPress themes to create stunning business websites. All these themes are handpicked to see that websites using them can be created effortlessly. They come with simple and intuitive customization options, professional designed and abundant features to let you create beautiful websites to represent your business website. If you are looking for some free WordPress template to create your business site, here are few of the best options. 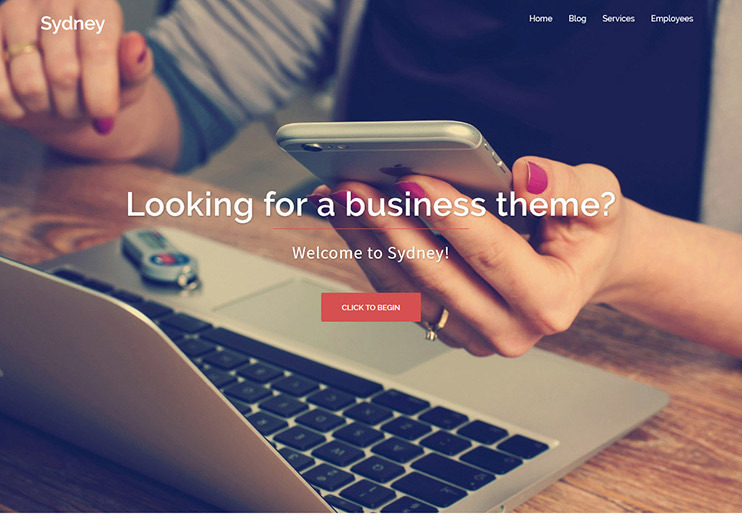 Sydney is a powerful free business theme. It can be downloaded for free. However, you can even opt for the paid version of the same theme, Sydney pro. The free version of this theme gives you a great and sophisticated design. It comes with beautiful parallax background sections, social icons, a live customizer, and useful theme options. Even the free version of this theme is enough to let you create a basic, simple but professional business website. Takeaway: Sydney is a popular free theme and is great for fresh looking, modern business websites. Scroll through the demo and you will absolutely love the animations and effects. Also, there’s a Sydney Pro if you need an upgrade. Astrid is a multipurpose theme with a simple but modern design that’ll add spark to your online presence in 2019. It gives you some basic customization options and features that you can use for your website. With the theme options, you can change how the website behaves. It has built-in layout options that can let you create a business website easily. With this theme, you can create a simple but beautiful website, all by yourself. It is simple, easy to use and flexible. 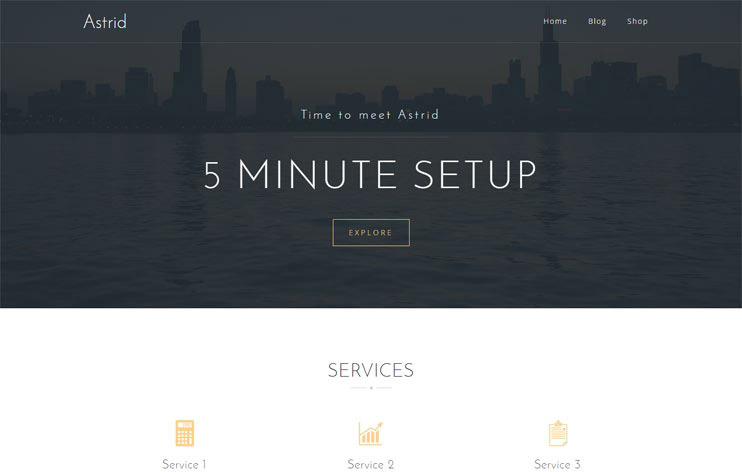 Takeaway: Astrid will give your corporate website a unique look and highlight your services. This theme is ideal for advertising your services, features with a professional touch. Neve is a modern, light weight, and beautiful multipurpose theme, that you can use to create professional looking websites. It has elegant design with animated effects on the screen elements. It is highly customizable and SEO friendly. Neve has the ultimate design features like staff section, pricing tables, testimonials, service section, contact form design, etc. 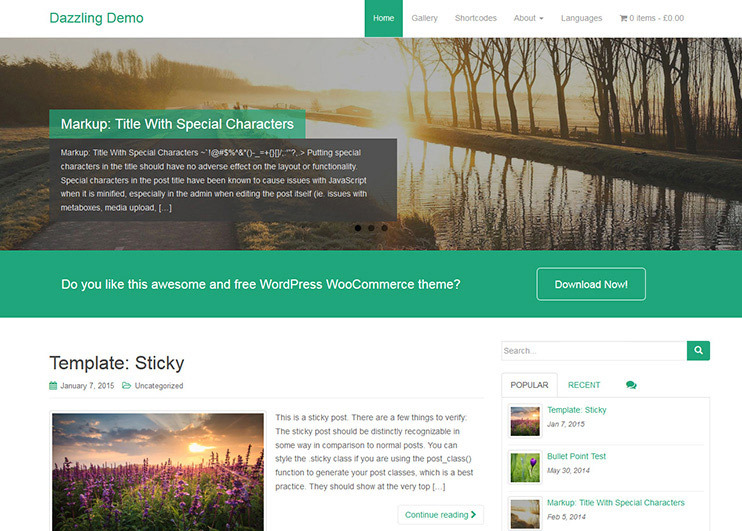 View the demo and you will see what makes this theme one of the best free WordPress Themes. Takeaway: Neve has a brilliant design. Watch it’s demo for the beautiful layout and the predesigned sections that makes website building so easy and interesting. 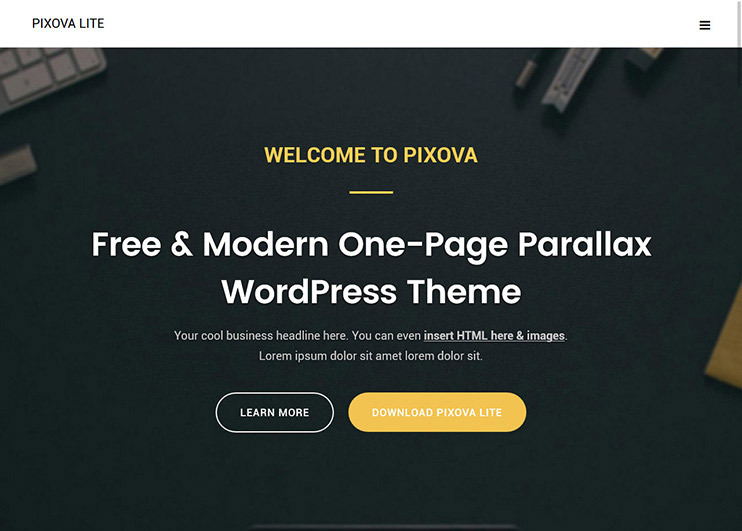 Pixova lite is a beautiful parallax WordPress theme that lets you create stunning websites. There is a paid version of the theme available that you can buy for additional features after trying the free version. You can create amazing blogs and portfolios in your website. There are enough customization options too. You can also use this theme to create an official business website. Takeaway: The parallax scrolling along with inline portfolio section makes it possible for you to showcase your work. 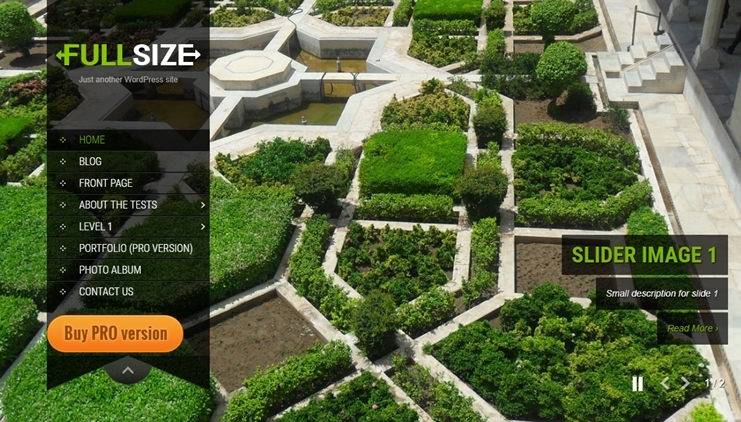 This theme is best for architects, designers or any such creative personals. 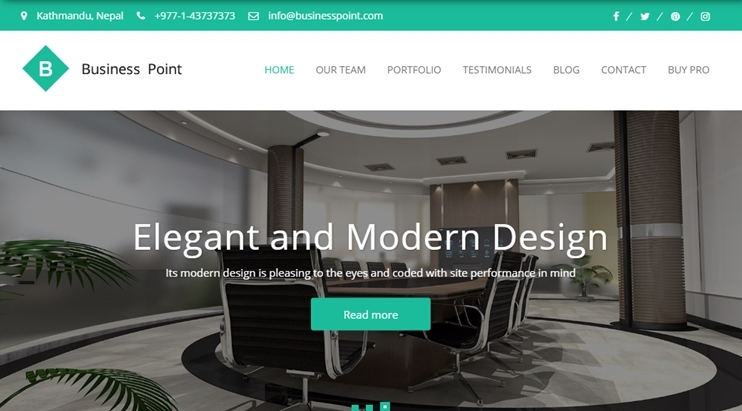 Business point is a portfolio style WordPress Theme to create business portfolios. This theme comes with abundant customization possibilities and a stunning design. It is SEO optimized and has different pre-designed sections to let you start with your business website as quickly as possible. Takeaway: The highlight of this theme are the spacious and beautifully designed sections to display your statistics, news, testimonials etc. 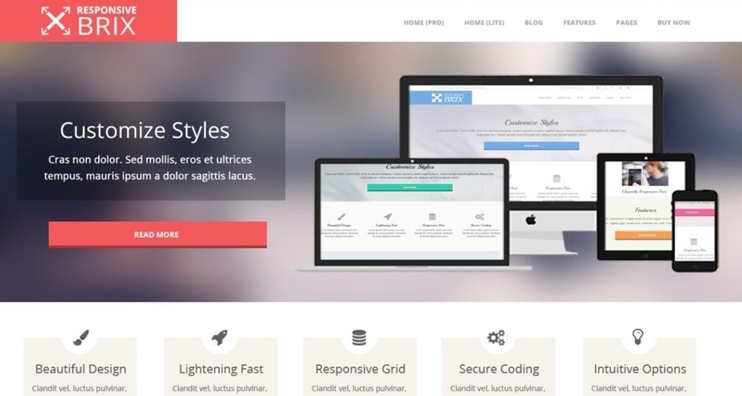 Onetone is a free one-page WordPress theme. It is designed to let you display maximum details on one page. The theme supports beautiful parallax scrolling and video background sections. It is one of the best free WordPress themes for business websites to create an online identity for your business. Onetone is SEO optimized. Your blog website can be easily managed using the theme options. You have predesigned sections to display your business details like services, clients, about, image galleries, etc. So, if you want to create a very simple one page business website, onetone is perfect. 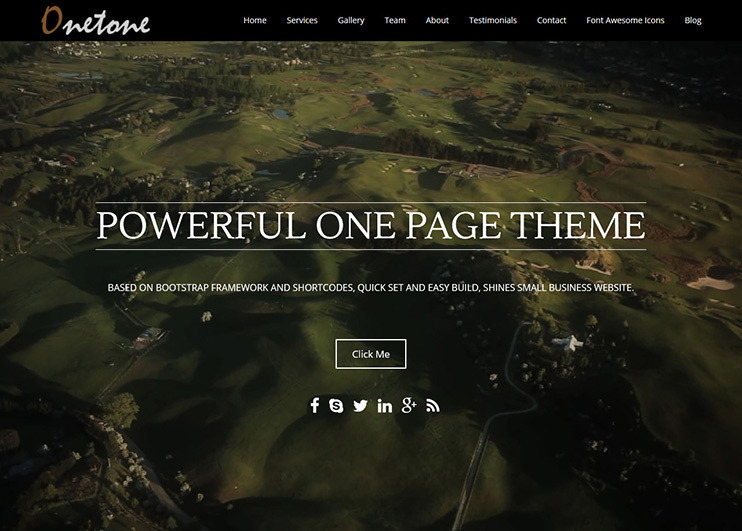 Takeaway: Build great one page portfolios or corporate business websites with the Onetone theme. Besides, you can get creative with the free yet feature packed Elementor page builder. Planning to start a blog. Here is a collection of some of the best free WordPress themes for your new blog. These are the best free WordPress themes for blogs. They are easy to use, highly customizable. You can manage your website with the available options, without touching a line of code. All these blog templates for WordPress are also SEO friendly. 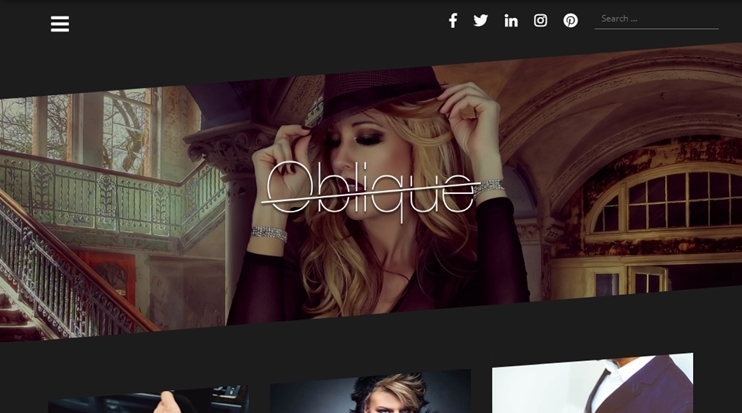 Oblique is a free WordPress blog theme that you can use to start a blog online. This theme comes with all the blog features you need and a unique design concept. It is easy to use and customize. This theme is fast loading and comes with light animations. Also the side menu gives an effective touch to the overall presentation of your site. Takeaway: This theme’s highlight is it’s design and presentation. The parallax banner is unique. You can even use the Oblique theme for your business websites. 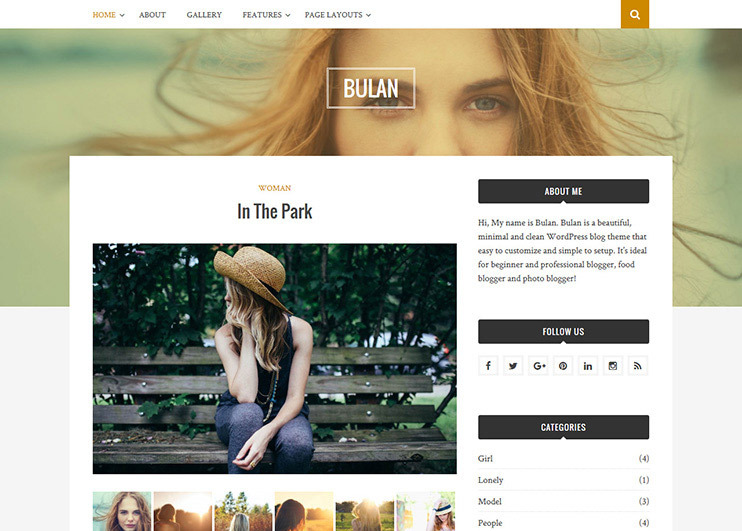 Bulan is a free blogging theme. It can be used by writers and bloggers. To download the theme for free, you need to create a free account by providing a valid email address. Once you get your account you can login and download it for free. You can choose from multiple homepage layouts. There are some customization and admin options to personalize the theme. It is social sharing ready and supports custom fonts as well as colors. Takeaway: Bulan has a simple yet modern design. However, you can go for this theme if you want to try your hand at creative website building with so many customization options. 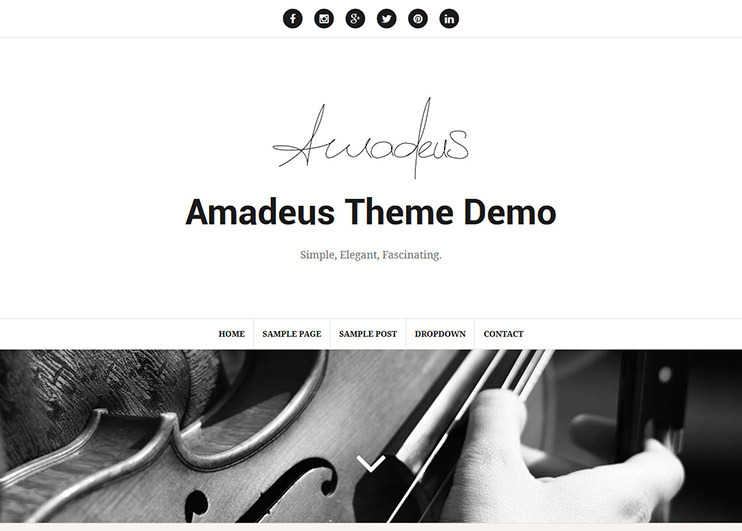 Amadeus is a blogging theme. You can download it for free and create a blogging website in minutes. It is flexible, well designed and easy to use. It has a beautiful design and allows embedding videos too. The theme comes with social media icons included in the header to inspire sharing. With the available theme options you can manage how your website behaves. Takeaway: Would you like to create a video focused blog/website? Then Amadeus comes with an easy way to embed videos to your site directly from the video hosting websites like YouTube, Vimeo, etc. 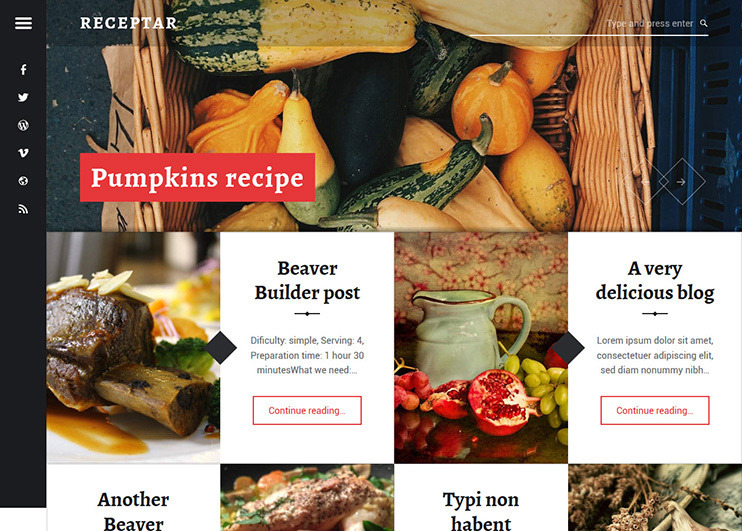 Receptar is a modern and high quality blog theme. It has a modern cooking WordPress theme. It is designed with beautiful images and typography. It allows integration of Beaver page builder to create pages. The theme is easily customizable so that you can make it look the way you want. With the available theme options, you can easily manage your website. Takeaway: This theme is a cook book styled theme and is ideal for your recipe blog because you won’t have to spend time customizing or updating an ordinary blog as per your the requirements of a recipe blog. 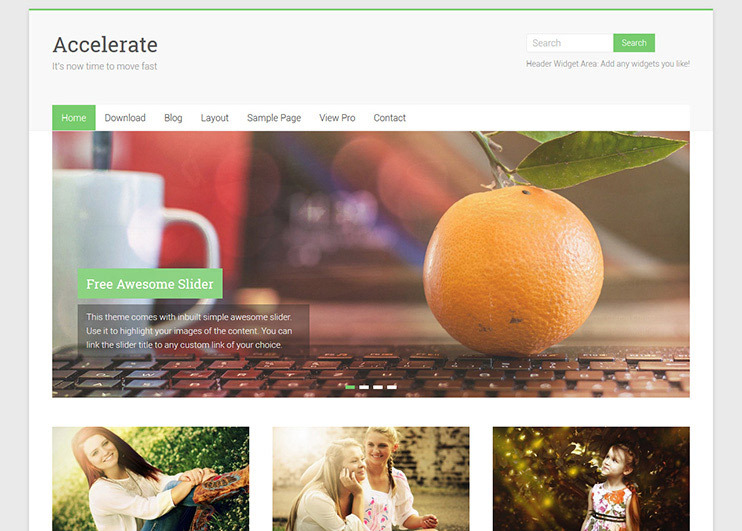 Accelerate is a multipurpose WordPress theme. It is a simple theme that is easy to use. With this theme you can create a blog website or a corporate business website. Accelerate will let you create blog website for topics such as food, travel, education, entertainment, etc. Besides you can also create a corporate business website to let you show and explain your services to your prospect customers. Takeaway: This is a theme for you if you want to create a simple, beautiful and informative website for your business, or a blog. The slider is good. Also, there is a pro version too. 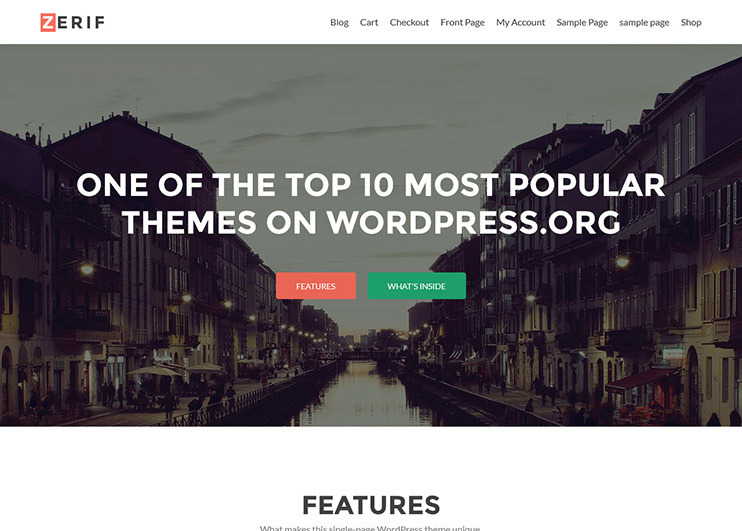 Expressivo is a feature packed and beautiful WordPress theme for your blogs. This is a multipurpose free blog theme that you can use for a fashion blog, lifestyle blog, travel blog, or any subject you can think of. It comes with some useful widgets to boost the accessibility of your content. It is SEO friendly and highly customizable. This free WordPress theme is speed optimized too. 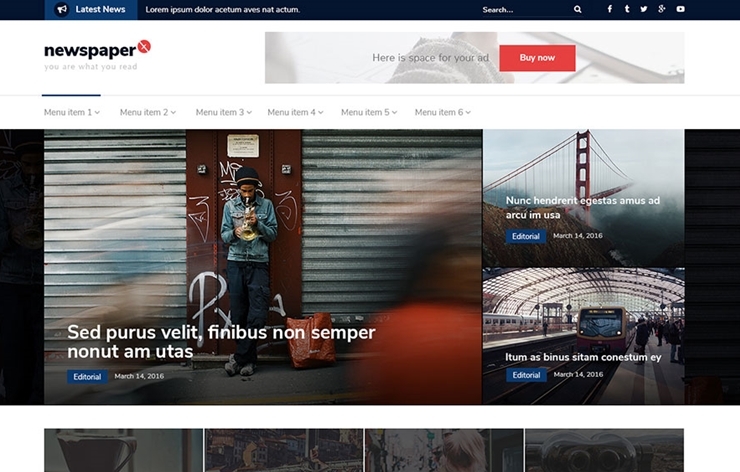 Takeaway: Expressivo is a content focused, and clean WP theme. The homepage will display the latest blogs and a content rich/customizable sidebar. 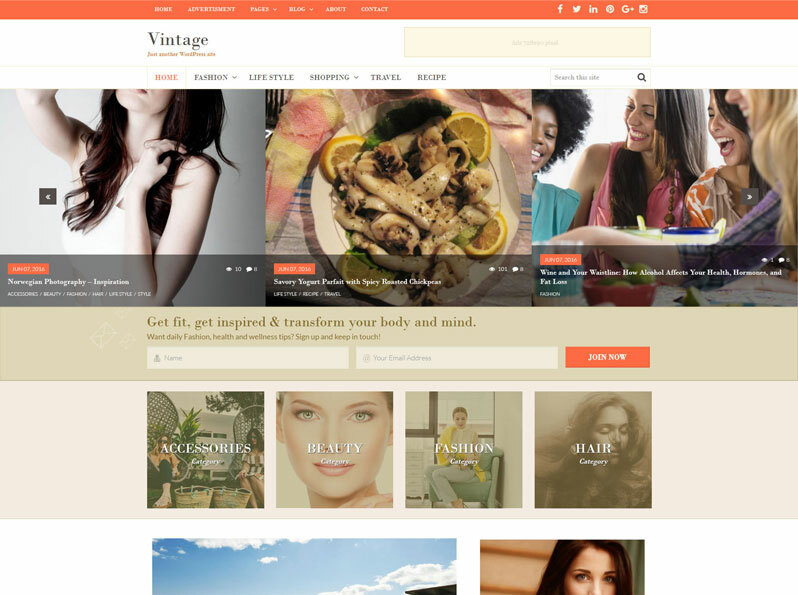 Vintage is a clean, elegant and easy to customize, WordPress theme. It is responsive and SEO friendly theme. The fully widgetized homepage makes it possible to easily rearrange the elements and create a design of your choice. Vintage supports google fonts and allows full color customizations too. Besides, it is advertisement ready to let you display ad banners and earn through your blog. Takeaway: This dedicated blog theme has a great way of letting you display your blog categories through expressive images on the homepage. This is a multipurpose blog theme with modern design. It is highly customizable. The theme is built upon the powerful Underscore S frameworks. 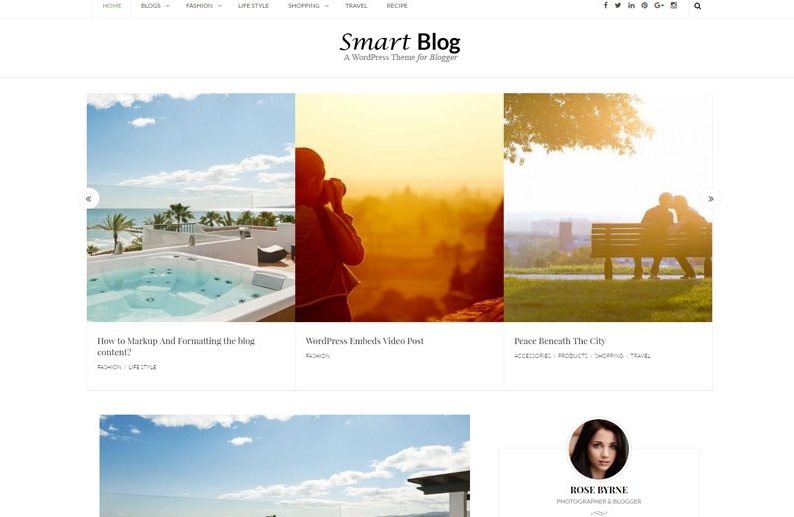 The smart blog is an SEO friendly theme optimized for the best performance. This theme supports Google fonts, color customization, and ad monetization. Takeaway: This is a very simple theme with a clean and modern design. Go for it if you want a simple blog website. It can be great for personal blogs. These WordPress themes free download are for professionals as well as newbies. These free Portfolio themes are ideal for you if you are new to WordPress and want to create an online portfolio. You can download one of these free themes and get started in minutes. You can use these free theme on localhost as well as live sites. If you are trying to get used to the WordPress dashboard, you can download these free WordPress themes portfolios to create yours easily. Want to create an online portfolio in 2019. 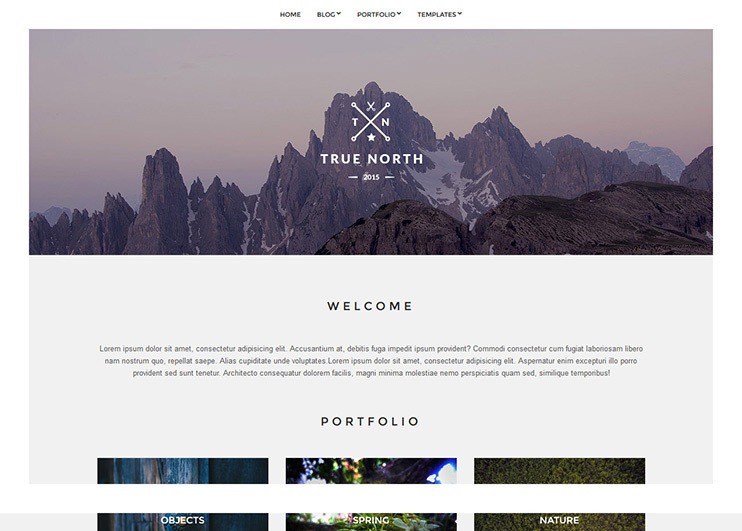 True North is a theme that is exclusively designed to showcase your thoughts, skills, services or work.There’s a special post type using which you can easily create portfolios. The theme layout can be managed using easy options. You can change how the theme behaves with easy options. The theme is SEO optimized. Takeaway: The design of this theme is simple with an inbuilt portfolio post type to let you create your online portfolio with ease. 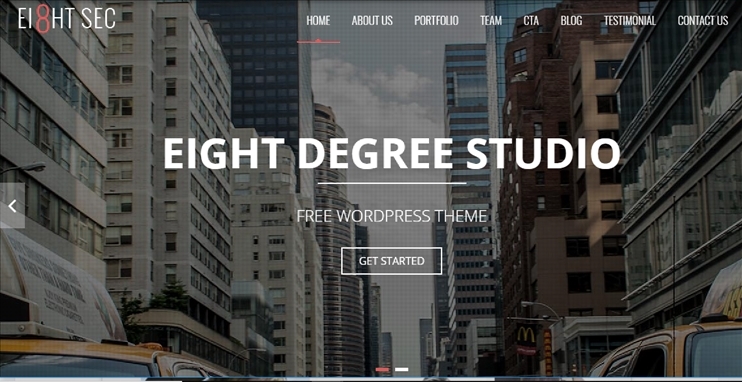 Eight sec is a well designed, SEO friendly multipurpose theme that you can use to create portfolios. The beautiful one page design is ideal for any business or professional portfolios. It comes with attractive parallax sections to create a stunning modern website. It has beautifully designed sections for CTA, contact form, testimonials, blog, etc. Takeaway: There is a full screen slider, beautiful animation effects, parallax scrolling, and a brilliant one page design. Blos is an ideal theme for professional portfolio. If you are a writer, author, artist, etc. 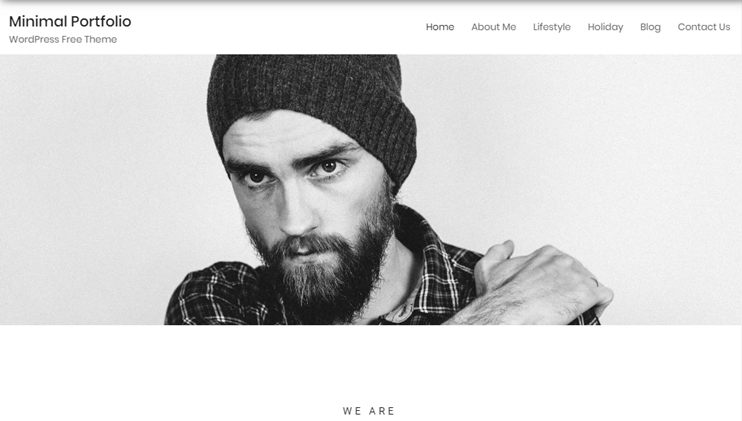 you can create your own online portfolio with this beautiful theme. It is a multi-page design with clean looks. Takeaway: The dynamic logo design is eye catching, and so is the full screen banner! If you are checking demo, don’t forget to visit the portfolio page. Minimal portfolio is a beautiful WordPress theme for creating professional looking online portfolios. This theme is ideal for photographers or artists to showcase their work and talk about their passion. The theme is responsive, has a great design, and is SEO friendly. Takeaway: You will love the tabbed portfolio section. Also the hover effects on individual portfolio items is really attractive. Dazzling is a modern business theme with a clean and beautiful design. With this theme, you can create the website with infinite scroll feature. It is easy to use and feature rich. Dazzling allows WooCommerce integration for eCommerce features. You can customize the website using the live customizer. You can set unlimited colors and font awesome icons. This theme can be used to create a website of unlimited niches. Takeaway: Display unlimited portfolio items through the infinite scrolling feature of your website. Besides, there is a flexible featured slider for your important posts. Agency is a free, creative and lively WordPress theme that you can use to create a portfolio website or photo gallery or a website for your creative agency. The theme comes with predesigned portfolio/gallery pages, about us, contact us and a well-organized blog page. This free theme is a beautiful option to represent your creative agency online. Especially, if you want to display your work using bright and vibrant design, you can use this theme. Takeaway: This design is really unique- Homepage is built of blocks of colorful masonry grid each directing to a post/page. 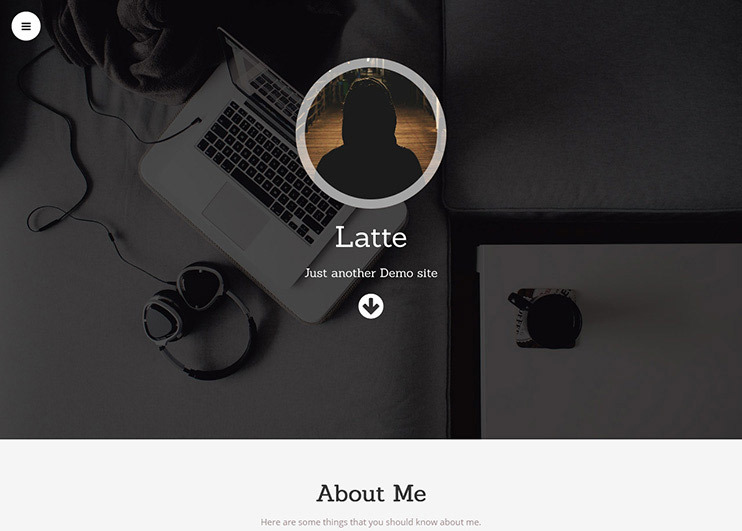 Latte is a very elegant one page parallax WordPress theme. 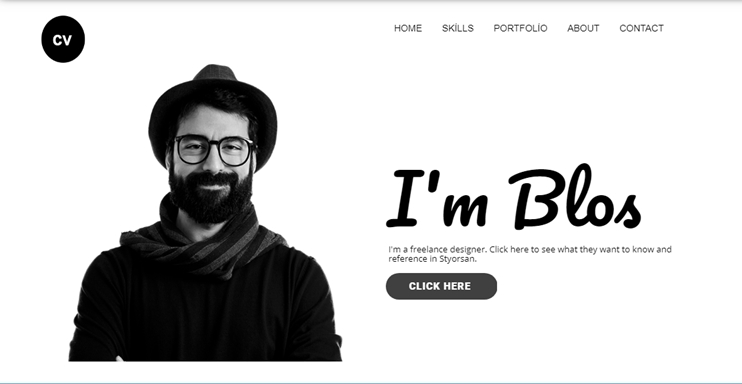 You can use this theme to create a website for developers, designers, and freelancers to showcase their skills and create their online portfolio. Latte is easy to customize and use. The basic WordPress customizer lets you change the theme behavior easily. It has features and designs through which you can show your work and skills. The service section lets you define what kind of services you offer. 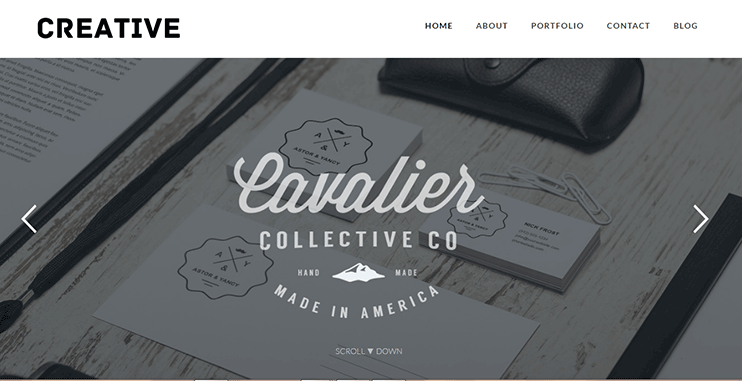 Takeaway: If you are a freelancer, this theme has a sophisticated and clean design. It is simple and easy to use to create your online portfolio. These are the creative multipurpose theme for your WordPress websites to create unique websites on your own.To use these free themes for your WordPress website, you will need no technical expertise at all. If you are new to WordPress and want to try your hand at website building, you shouldn’t hesitate at all. These themes are as easy to use as the mobile apps you use on your mobile phones. Just install them, log in to the dashboard and the self-explanatory options will help you set it all up on your own. Flatter your inner inventive self with these free themes download. Creative WordPress theme is an elegant theme to build a website for your creative agency in 2019. This theme can be used to create a business or a portfolio website too. You can also use this theme as a blog website. Each and every page of the theme is beautifully designed. With this theme, you can create a responsive, SEO friendly website with modern looks. Takeaway: You can create a website with the boxed & wide layout, light & dark color skin for your site. With the customization options you can create a website of your choice easily. 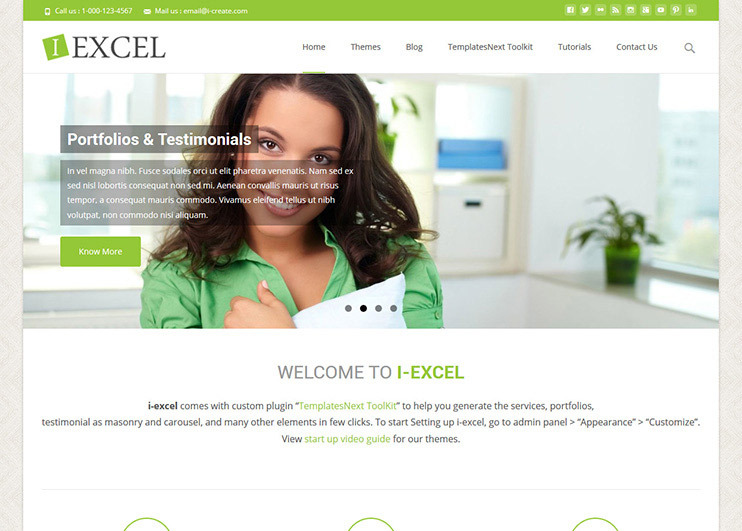 i-excel is a feature-rich and flexible WordPress blog theme. It is easy to use and comes with the customization options to make it look and behave the way you want. 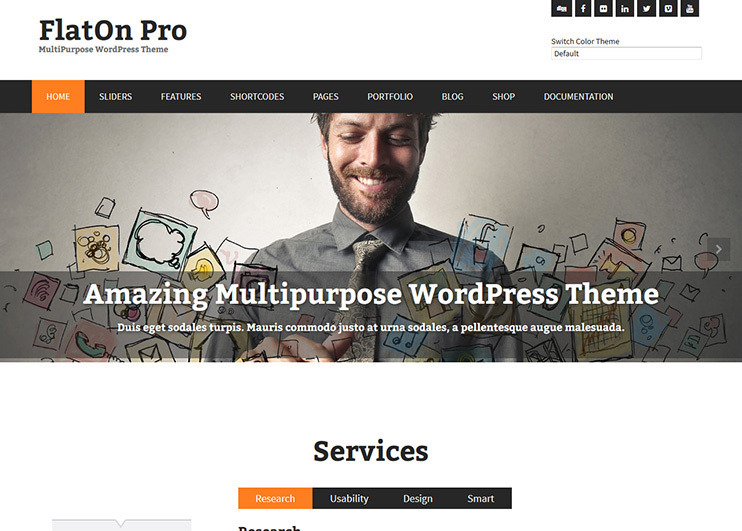 With this theme, you can create a website with multi uses. You can create amazing portfolios, business, blog or personal website. It is WooCommerce ready. It also allows you to create an amazing blog and portfolio carousels. Takeaway: There are multiple free demos to choose from. You can even use the SiteOrigin page builder to create your pages with drag and drop options. If you want to display your architectural ventures using a sleek and simple design, here is the free architect theme that you can use for it. This theme is easy to use and flexible. It focuses on images and allows you to add beautiful, high-quality images of your work. The theme can be used for almost any other purpose too. You can display your photography, painting, or any other creative work with this theme. Moreover, it is SEO friendly and responsive. 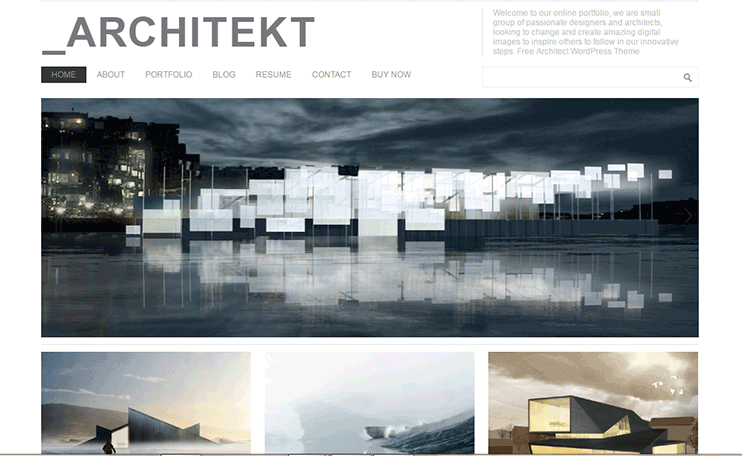 Takeaway: Ideal for architects, this theme can be used by designers, artists or any creative person to create a professional looking, feature rich portfolio website. 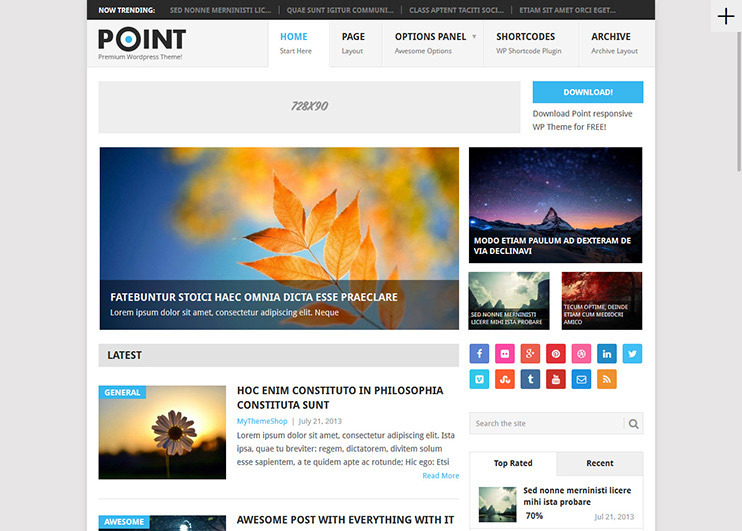 Point is a free multipurpose theme. You can use this theme to create a business website, creative agencies or any other subject. It is flexible and easy to use the theme. With the advanced admin options, you can manage the theme behavior. There are basic customization options available for your website. The theme has an inbuilt feature to show the related posts. It is SEO optimized. 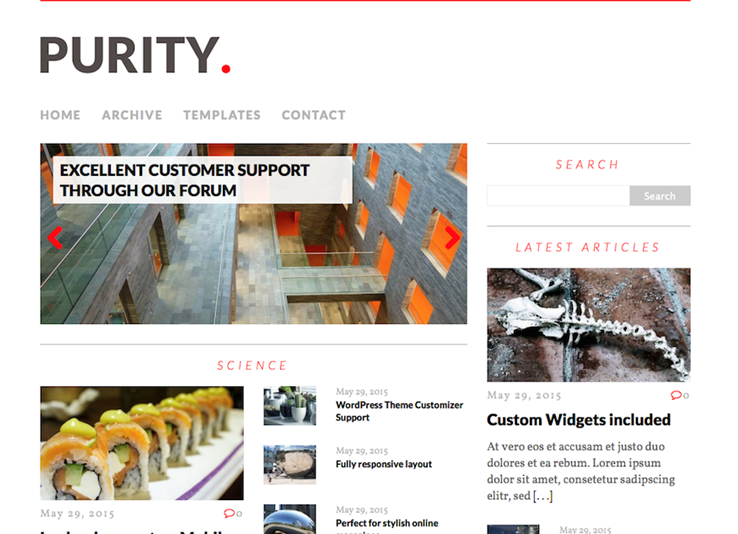 Takeaway: This free WordPress theme has a good magazine-type look. Great for creating blogs/magazine with advertisement ready website. Zerif lite is the free version of Zerif pro. This lite version is a free One page WordPress theme that can be used for multiple purposes. You can use this theme to create a website for your business or a blog website. With this theme, you can also create a corporate website or a website for your creative agency. It comes with a full screen image and a parallax slider. The theme has a clean and modern design. Zerif lite is eCommerce ready as it supports WooCommerce. It is SEO friendly. It comes with some basic features and customization options. For added features, you can buy the zerif pro theme. Takeaway: Don’t forget to check out the live websites created using this beautiful theme. Zerif also lets you create fast websites easily. Skt full width is a professionally designed WordPress theme that can be used for any purpose of your choice. It comes with multiple pre designed pages and features to create user friendly websites easily. It is SEO friendly too. Takeaway: If you are a Photographer, designer, blogger, or a business person, this full width theme is for you. You can even create online portfolio, or a website for design studio, corporate sites, etc. 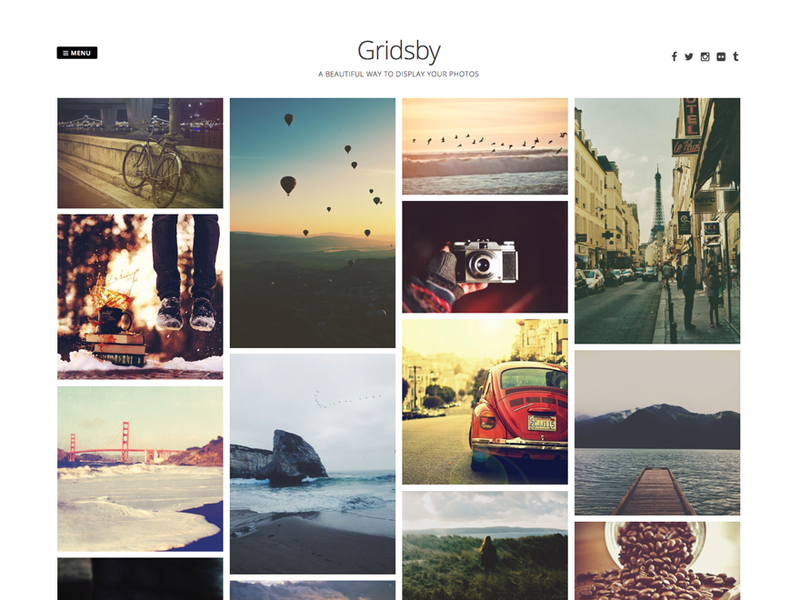 Gridsby is a pintrest styled theme that is ideal for art or photography portfolio. This theme comes with a very easy method to post new photos to add to your gallery. Gridsby supports retina images so that you can upload high quality pictures that leave an impact on the visitors. Takeaway: Gridsby is best for photographers or graphic designer to create their pinterest board styled website. 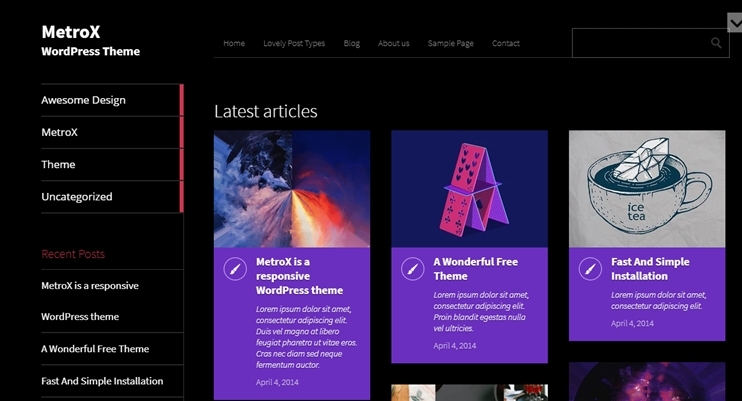 MetroX is a beautiful Free WordPress theme that can be used for any purpose of your choice. Pick it for online portfolios, blog or a business website.This theme comes with different styles for different kind of posts. The theme is crafted with a clean and well-commented code, so if you want to extend the theme features by tweaking the code, you can do it easily. Takeaway: Metro is a dark themed template for your magazine styled website. It can also be used for your blog website. Responsive Brix is speed optimized, multi-purpose WordPress theme. This theme can be used for creative studios & agencies, businesses, portfolios, and church websites. You can use 360+ font icons to make your website more intuitive. Responsive Brix is SEO friendly, mobile optimized, speed optimized and comes with a clean design. Takeaway: This theme is really fast, and has a minimal and clean design for blogs that focuses on the content. You can use it for blogs as well as business websites. Found your favorite Free WordPress Theme? Above mentioned were some of the most popular free WordPress themes. These free themes are ideal for you if you are new to WordPress. You can download one of these free themes and get started in minutes. You can use these free theme on localhost as well as live sites. If you are trying to get used to the WordPress dashboard, you can download and install one of these free themes to get started. Some of the free themes in this list also have a premium version. The free theme is for illustrative purpose. It is kind of trial version, and with the paid version of the theme, you get more features and more options. So if you are thinking of switching to a paid version in the future, but want to start with a free theme for trial purpose, you can pick up the lite version of the required theme. Once you start using the free versions of the WordPress themes, you will be able to decide better! And since the themes are free, you can try different themes at once and settle for the one that best fits your requirements. Hoping you enjoy your free theme download. Good Luck!